Neds’ Bookmaking Roots Run Deep: Though Australian-owned Neds only went live in early October 2017, its creator, Dean Shannon, has deep roots in Australian bookmaking. Some may recall Shannon as the entrepreneurial force behind Bookmaker.com.au, an Aussie wagering agency that would eventually be swallowed, for better or worse, depending on your point of view, by Ladbrokes. The timing might seem slightly odd. With an October launch, they missed out on a chance to take in revenue from the finals of the AFL and the NRL. On the other hand, they did show for spring Thoroughbred racing, just in time for the Caulfield Cup, the Cox Plate, and the Melbourne Cup, along with all the other group races that make October and November especially exciting times for racing punters. User-Friendly With A Large Variety Of Choices: Like most Australian bookmakers, Neds is licensed in the Northern Territory. It also offers betting services to punters in the UK. What's more, Neds has one of the best selections in all Australia for lottery betting, with its own division just for lottery wagers. For sports and racing, Neds is already competitive with most other major Australian bookmakers, but with a distinct advantage for beginner punters with its easy-to-understand website. Early On, Neds Looks To Deliver Quality: From several early visits we made to the Neds website, it seems as though they were in the planning and development stages for some time and did not rush to light up a website that was ill-prepared to take on the major corporate operations. That said, it is hard to evaluate Neds with complete objectivity, because until they have some time to establish a reputation and back their claims, there is no history—except for that of its creator—on which to rely. Given the intense scrutiny to which the Australian Government subjects online bookies, however, combined with Mr. Shannon's experience and reputation, it would seem that punters’ funds are safe with Neds and that Neds will deliver on their promises. As you’ll see, though, they have leapfrogged their way into the top echelons of Australian bookmakers by their careful attention to both detail and impeccable customer service. Here, then, is a brief look at Australia's newest entrant into the crowded setting of online bookmaking and hopefully, some initial guidance to anybody interested in a membership with an up-and-coming online bookmaker. Uncluttered, Easy-On-The-Eye Layout:We truly appreciated the uncluttered, logical layout of the Neds pages. We did not at all mind the orange on the various columns. Anything is better than red, which as the neuroscientists will proclaim, is a colour known to stimulate impulsive behaviour, and the last thing anyone needs when trying to select logical markets is to be goaded into making impulsive decisions. Familiar Territory, Yet Better-Organised: The website features the familiar three-column approach that seems to fall under the heading of ‘If it ain't broke, don't fix it’. On the left-hand side of the page, you’ll find all of Neds’ available betting types, which include sports, live in-play (by telephone only), and of course, racing. The link to their promotions page, as well as their extensive how-to section, are also located on the left-hand side. Their QuickLinks section, also on the left-hand side, can get you to the most popular markets quickly. In the top section, you can find a link to your bet slip, the cashier, information on your pending bets, and your account’s balance. All familiar, yet its spacious feel gives it a more relaxed ambience—perfect to put both new punters and old-timers at ease. Doubtless, Shannon’s expertise with Bookmaker.com led him to select an interface that gave punters a sense of instant familiarity with the layout. A comfort zone, if you will. For that reason, punters who hold multiple bookmaker memberships will be able to wade right in straightaway without a steep learning curve. Lots Of White Space & Clear Fonts: Viewed on a 600-millimetre monitor, there is plenty of white space with subtle grey text in a clear font that makes proper cursor placement and link selection simple. One seeming omission we found perplexing is that at the top of the pages, we did not find a labelled option to return to the homepage. With some experimentation, we discovered the way home—click on the large Neds name in the upper left-hand corner of any page. When you do click on the Neds logo, the homepage opens in another tab—which may be off-putting to some, yet has its merits. That way, if you were on your betting slip or another page you needed to get back to quickly, all you need to do is to click on the tab without consulting the menu. A time-saver, once you get used to it. No Audio Or Video Streaming: Yet another feature that we missed was audio or video streaming. We will withhold judgement on this until later because those features could be in the developmental stages. Building a superior website, after all, takes time. In-Depth Explanations: In our opinion, Neds has one of the most user-friendly websites for new punters. Not only does it explain betting terminology, but it also provides concrete examples of how complex bets—such as multis—work. The site walks users through a step-by-step process that demonstrates how the site determines the winnings on various types of bets. FAQs, How-To & Help Sections: Extensive FAQ, help, and how-to sections that are heavy on detail assist those new to the Neds site to feel comfortable navigating through all the site’s features and betting opportunities. These comprehensive sections offer enough information for even those new to betting to register, deposit funds, place one’s first bets, and withdraw funds with confidence. On-SiteTechnical Help: Neds’ developers have done a great job of identifying some common on-site problems, such as those caused by cookies: pages that load slowly or not at all, disappearing bet slips, bet slips that don’t display bets, or the system logging customers out of their account. Neds even provides instructions to help troubleshoot cookie-caused problems for all mobile devices and desktop operating systems. Sample Screenshots Throughout: One of the most striking features of all on the Neds website is its illustrations on many of its sections. Not only do they provide easy-to-understand instructions, but they also show the process step-by-step with screenshots that illustrate each major step. Soon-Upcoming Events: At the top of both the racing and the sports pages, you’ll see a list of upcoming events, together with the time until the start of the event. These reminders give punters a chance to get in on the action online before the event goes live, necessitating a phone call to bet. Neds offers mobile apps for iOS, Android, and Windows mobile operating systems. With these apps, mobile betting is just an easy download away. Once the app downloads and you can see the icon, you can click ‘Open’, and then log in (or sign up, if you haven’t signed up for a Neds account) to get started. App Or No App Functionality: If your mobile device is chock-full of apps and you don’t want another, no worries. You can easily access the regular Neds site with your device’s browser. It’s easy to use, even without the app, since the site is mobile-optimised for all the major mobile devices, including both tablets and smartphones. Deposit & Withdraw On The Road: Neds makes it easy to deposit money and withdraw your winnings while you’re on the go. You’ll never have to fret if you’re stuck in traffic. Just pull over, place your bet on your mobile device, and head on home or to the event itself if you’d like to watch it in person. Mobile Site Evaluation: We ourselves are Android-based, so this is the app at which we looked, making the assumption that the apps for the other operating systems would offer similar functionality. We began by opening Neds.com.au in a Chrome browser. When nothing happened immediately, we took a moment and discovered that our slightly older version of Android is not supported by Neds’ mobile app, so we could not see any markets, just the spinning beach ball that claimed the site was loading. This seems like another oversight on the part of Neds to us since other bookmakers' mobile apps function just fine on our aged Android. Then again, we still make fire by rubbing two sticks together, so it could be a case of our simply needing to move further forward into the 21st century. Neds supports only Android versions 4.4 and above. iPhone users should not experience any issues since, unlike Android, the app is available in the Apple App Store. We used to feature these prominently in our bookmaker reviews, but since state restrictions for Northern Territory-licensed bookmakers render sign-up bonuses nearly meaningless, we do not devote much time or space to them. Because these promotions are highly regulated, we recommend that you read Neds’ terms and conditions before you claim any promotional or bonus offer. First Bet Bonus Promotion: Neds does offer a bonus bet promotion for customers whose first deposit is $250 will match it with a $300 bonus. As with the other bookmakers, we expect that outside of Northern Territory and perhaps Tasmania and Queensland, punters will find restrictions on eligibility, but Neds is so new that we are not able to determine with absolute certainty if this is the case or not. Before you make a withdrawal on any bet, you’ll need to wager your initial deposit and your bonus bet on win-only wagers. 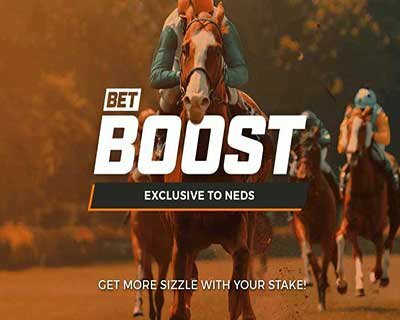 Bet Boost: Neds offers its members a Bet Boost offer that essentially increases potential dividends on fixed- odds Australian racing. Adding a market to the bet slip will reveal if that market is eligible for the Bet Boost promotion. In general, punters are limited to one Bet Boost per day, but Neds claims that there may at times be special promotions that will enable additional Bet Boosts. Neds makes this exclusive offer at no extra cost to its customers. Just click on the link labelled ‘Neds Bet Boost’, and choose it on your bet slip. To deactivate this feature, just go to your account settings, follow the prompts, and deactivate it. Other bonus offers will be found on the My Account page under the heading of ‘Bonus Offers’. This section also clearly states the expiry dates for bonuses of that nature. Neds Multi Bets: Neds does support multi bets. For racing bet types, Neds offers about ten choices, but in the interest of disclosure, we feel compelled to mention that this information comes straight from the Neds website, as the agency is too new to have much in the way of objective third-party information. They do offer a variety of multiple bets users may place on various sporting and racing events. They do, however, limit these bets to unrelated events to avoid redundancies. For example, if a punter wants to bet on, let's say, the correct score between Turkish football club Beikta and their rival Galatasaray to be 2-0 Beikta—and also to bet Beikta to win—that bet would not be allowed, since the 2-0 score would mean that Beikta has already won the match: a redundancy and thus disallowed. Even more appealing, if you download the Neds app on your mobile device, you can leverage the power of multi-bets in just a few swipes and taps with the site’s ‘Multi Builder’ feature. Neds’ powerful app allows you to cross the lines between racing and sports to build multi bets on the same screen, saving you time and effort. Multi (Accumulator, All Up, & Parlay: Neds allows punters to choose two or more single bets from both sports and racing to combine, up to a total of 16 selections in all. This option increases the chance of a better return, says the Neds website. The system determines the final dividend by multiplying the odds of each of a bettor’s selections. Single Multiple: This type of bet, also limited to 16 selections, requires that all competitors that a punter chooses must win to claim winnings. Neds Toolbox: Neds has been around for just a year, but they have made quite an impact with their constant innovation and efforts to keep things interesting, for racing punters in particular. Their most recent effort, just about a month old as of late October 2018, is called Neds Punters Toolbox. There are four “tools” in the box, each designed to supply racing punters with an additional edge to support their wagering. Two of the tools, Price Boost and Fluc Up, give punters the opportunity to have a selection’s odds increased. The other two, Jump Off and Back Up, supply punters with a little extra security. Here are some details on the promotions in Neds Punters Toolbox and how to use them with regard to racing punting, however, like all bookies and bookie promotions, it will be necessary to understand the limitations of the tools thoroughly before using them to confirm any wager. Neds Toolbox - Price Boost: Neds makes certain races eligible for the Price Boost tool. Price Boost is simple to use. After a horse is added to the bet slip, clicking on the Price Boost button will show the increased quote. The icon for the feature will only appear when the race is one that Neds has declared eligible for the feature. Adding the stake amount to the bet slip, up to a maximum limit of $1,000, is the next step. Once the correct selection and the stake amount are confirmed by the user, the bet is confirmed and will be found under the pending bets section of the website. Price Boost seems to be the simplest of the four tools. Neds Toolbox - Fluc Up: Neds has always displayed a cheeky tendency and the name of this tool tends to carry that concept forward. What it supplies to punters is the opportunity to benefit from price fluctuations in the market subsequent to placing a bet on an eligible race in Australia or New Zealand. Punters are permitted to have a price that drifts out on a fixed odds win bet escalated to the next highest quote. Of course, a fluctuation increasing is often a sign that the selected runner’s chances have declined, but sometimes horses drift out because money is coming in on the others in the field, not because the selected horse has suddenly gotten slower. In order to Fluc Up, punters have five minutes from the time they place a fixed odds win bet to move to the higher quote, so this tool is geared toward those punters who wait until a race is close to the jump to submit their bets. Like Price Boost, the increased quote offered by Fluc Up, after confirmed by the punter, will be found under pending bets. Neds Toolbox - Backup: Again, subject to Neds terms and conditions and race eligibility, Backup is a way to bet on two horses for the price of one. Along with the primary selection, punters get to pick a second racer as a Backup. If the first selection finishes second to the backup, a punter will receive his or her stake back, up to a maximum limit of $500. Punters use the Backup button on the betting slip to make the second selection, so the Backup tool is quite easy to use in that its icon will only be seen in the race qualifies for the promotion. The backup runner will be shown in the pending bets section and to make it even simpler to manage; it will be in blue text immediately below the primary selection in the pending bets section. Neds Toolbox - Jump Off: This might be the most interesting of the four in the Neds Punters Toolbox. Simply stated, a punter with a selection on an eligible race can cancel the bet after the race has started, up until a time specified by a countdown timer. The idea, for punters that watch racing live, is that if the backed fixed odds horse in an eligible race seems to be having a bad day, or had a poor jump or a bad barrier, the punt can be cancelled, so long as the Jump Off timer has not counted down to zero. It is a two-step process-clicking the Jump Off button and confirming the wish to cancel the bet. Punters will have their stake returned to their punting accounts as soon as the race result is settled. Neds offers Australians several choices when it comes to funding their betting accounts and settling their bet slips. The payment methods are secure and you will find some are instantaneous, so you can get betting on that race which is on in just a few minutes or the best try scorer for the game that’s about to be broadcast. Deposits: Neds only accepts Australian dollars for account funding. Instant deposit options include Visa, MasterCard, BPAY, and POLi. Clients can also apply for a Neds card and fund their accounts through that method. Although slower, you may also deposit funds in your Neds account through BPAY and bank transfers. Their minimum deposit is $5.00 for most types of deposits. Withdrawals: Before you withdraw funds, you must meet turnover conditions and verify your Neds account. Otherwise, you can withdraw your winnings through Neds’ bank transfer option. Count on one to three days before you can access the funds, though most punters receive their money within a day. Right now, all that Neds offers for withdrawals is online transfers to your bank account. Use the ‘My Account’ section to request an online withdrawal, and Neds will pay the funds directly to your bank account. They do allow punters to use several bank accounts for withdrawals. Withdrawals must be at least $10.00 or more. For most banks, you can receive the money the next day, as long as you request the funds before 12 noon (AEST). Some banks, the Neds site cautions, may take longer to process these transactions. Margins: Because Neds is so new, we cannot supply any information of an accurate nature with regards to Neds’ margins. We speculate that they will be competitive with other domestic agencies with regard to domestic markets, but speculation is all we have at this point. Neds Racing Markets: With a huge range of racing markets available to bet on, Australian and New Zealand punters will be delighted. With a wide variety of both harness and Thoroughbred racing in Australia and New Zealand, as well as many international horse races of both kinds, racing fans will have plenty of exciting events to choose from. They also feature greyhound races for fans of the speedy pups. As with all things on the Neds website, they have displayed their racing markets in a format that’s easy to read and easy to scan. All a punter needs to do is to click on the race she or he wants, and then select the race number to see the odds and bet. The racing markets also include some features that can help extend your betting budget. They offer a Money Tracker feature, Featured Bets, Fluctuations, and their racing promotions to help punters stretch their dollars. Just like they do throughout their super user-friendly website, Neds’ racing section provides handy guides that help even new bettors get comfortable with the process and make the process go more smoothly for old-timers. For example, just below the listed odds, you’ll find a guide to the basics of betting. This guide contains plenty of details on every betting term, as well as a clear definition of each, so newbies can get up to speed quickly. Neds Sports Markets: A wide variety of sports betting choices is available through Neds. They include the most popular sports, such as cricket, rugby, Australian Rules, international football (soccer), American football, baseball, hockey, basketball, and boxing. Less-familiar, yet clear fan favourites for Neds customers, include auto sports, cycling, darts, e-sports, golf, handball, mixed martial arts, snooker, surfing, tennis and many more. Though politics isn’t technically a sport, Neds even has a category for it on its sports page. Cheer on your party’s candidates and put some money on them to boot. Even international politics is fair game here. On the Neds main sports page, you’ll find upcoming events, together with a countdown to their start time. The page will also feature any upcoming ‘big events’, such as the American Super Bowl, the NBA championship, the World Series, and other seasonal sports happenings. You can also click on your favourite sports’ category to see what upcoming events there are, as well as the markets on which you can bet on these events. The promotions section also has several sports specials each week you may want to check out. Live in-play betting is also possible for many international sports events. You must, of course, call in to bet on live in-play events. You can call the live betting number, 124 777, during their open hours: 7am through 11pm in the AEST time zone. Use this time and date converter to calculate their open hours in your own time zone. Joining Neds: Neds makes it easy to open an account. After you navigate to the website (www.neds.com.au), look at the upper right-hand corner of the homepage. Click ‘Join Now’. There will be a short form to fill out—it should only take a few minutes. After you fill out the form, click ‘Continue’. Next, you’ll choose your username and password. Use a password that contains both numbers and letters and that is at least six characters long. After you do, you’ll need to provide your mobile phone number, home address, and date of birth—then you’re done. After you have an account, you can make your first deposit. Account Verification: Neds requires all its customers to provide verification in compliance with Australia’s anti-money laundering legislation and to protect their customers from fraudulent use of their account. Electronic Verification: Australian citizens and residents can verify their identity electronically using Equifax’s IDMatrix. To use this system, go to your ‘My Account’. Select ‘Verification Centre’. Next, choose ‘Verify Me Now’. Just follow the prompts, and you can verify your identity in a few minutes. Just make sure that all the documents you supply are current. If not, wait to verify your identity until you have new documents with the proper information on them. Certified documents: International customers or customers who could not complete the electronic verification system must present two certified documents to verify their identity. The primary document must be a passport, driver’s licence, a Key Pass, a Proof of Age Card, or a National Identity Card. Unfortunately, customers living in the United States are prohibited from betting with Neds.com.au. Neds Customer Support and Contact Information: Neds makes it easy to get in touch with both customer support and the phone betting line. They recommend that users check out their extensive FAQ and Help section and their how-to sections before they call, email, or submit a question through chat. Customer support by phone operates seven days a week for 16 hours a day (7am to 11pm) in the AEDT time zone on 1300-00-NEDS (6337) They also answer emails submitted through their contact form on the ‘Contact Us’ page of their website and chat messages within 48 hours, should you contact them after closing. Online and telephone betting is available 24/7. The telephone betting line is 134-777. ID Verification: Neds takes its customers’ security seriously. The company requires customers to verify their ID within 45 days after they place their first bet or make their first deposit. If a customer’s address or name has changed since they signed up for an account, the company may suspend the account until the customer verifies the new details with documents that match the new personal details. Suspected Fraudulent Activity: If Neds notices suspicious activity, such as duplicate accounts or unusual patterns of betting, it may suspend a customer’s account to protect them against hacking or other fraudulent use. Neds Commitment To Responsible Gambling: Right off the block, Neds committed itself to help punters stay within reasonable limits with their responsible gambling policies. They seem to realise that informed, disciplined punters stay in the game for the long run, so they offer several features to help customers gamble responsibly. Self-Help Guide: One of the best guides out there, Neds’ common-sense betting guide gives down-to-earth advice on how to keep gambling fun. Keeping over consumption of alcohol to a minimum makes for better betting decisions, as does setting a budget with one’s family or household and sticking with it. Strict Policies That Encourage Responsible Gambling: Neds pledges to refer gamblers who have chronically overindulged in what should be a pastime to resources that can get them help. They have a rigorous staff training policy, as well as strict guidelines that will help reduce the incidence of underage gambling. Self-Exclusion & Limits Options: Neds customers can set limits on their spending on bets. They can also exclude themselves from the site for a set period or permanently, if they prefer. We feel comfortable in recommending Neds because they bring a formidable new competitor to the bookmaking industry in Australia. For punters, competition is healthy because it motivates new players in the industry to offer their clients more perks to gain traction in the market. We also have some degree of trust, given Dean Shannon’s wide-ranging experience. We do not feel comfortable recommending Neds as a sole source for one’s betting options, but we would say the same about all bookmakers. Shopping for the best markets, odds and margins is a large part of the entertainment value of online wagering to us. It will be interesting to see what happens over the course of the summer as Neds cuts its teeth and adjusts to wagering market demands. We will return to review Neds again after we have a further look at them when the major domestic markets of the AFL and NRL resume. Their special features—such as their no-extra-cost Bet Boost and their Multi Builder—make them already a top contender in the Aussie bookmaking market. For the moment, we think Neds has room to grow and definitely deserves consideration for punters who appreciate a home-grown operation. If you’d like to find out more about Neds, have questions about betting options, or would like to enquire about creating an account with Neds, call us. We’ll be happy to provide any help, assistance, or services you need for a top quality online betting experience.